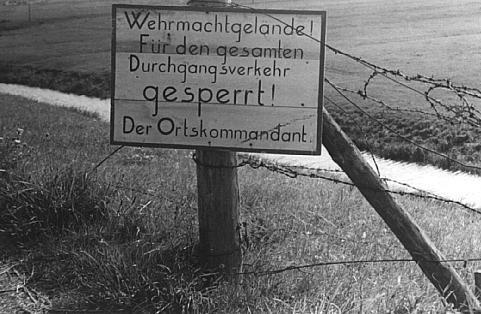 in the vicinity of the farm, hence the sign on the ramp with "gesperrt" - entrance prohibited. Once I had published these photos on internet at the beginning of the 21st century, I got two or three e-mails with the question what these funny buildings in the background of various photos could be. I couldn't give an answer, I hadn't even noticed them before! 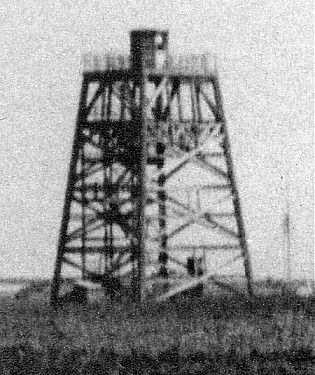 A few years later I happened to find some of my own photos on a website describing these towers, which were used by the German Wehrmacht to find out the position of hostile aeroplanes. There were more of these RDF stations in our country, all of them with the name of a flower beginning with the same letter as the nearest town or village. E.g. Schagen beginning with s, so Schneeglöckchen also began with s.
Of course these observation posts were manned with German soldiers. Sometimes they escorted residents of the surrounding farms when those wanted to visit eachother, because they were not allowed to walk through the area uncontrolled.